You’ve decided to go vegan — now what? Like millions of others, you’ve taken a huge step in an effort to improve your health, minimize animal cruelty, minimizing environmental damage, curbing greenhouse gases — and possibly all of the above. Transitioning to vegan and maintaining a healthy diet can be a challenge. But if you’re determined to live without animal products, it can be done, and you’ll find some useful tips below. A vegan diet is free from any and ALL animal products including meat, milk, eggs, yogurt, cheese, even foods processed with animal products such as gelatin. What remains in the typical vegan diet and forms the basis for most vegan meals are whole grains, beans, legumes, vegetables, fruit and nuts. But just because your new vegan diet is free of animal products, that doesn’t mean that it there’s no danger of making poor food choices that can prove even more harmful to your health. Sugar and other sweeteners, white flour and processed snack foods might be vegan, but that doesn’t mean they’re good for you! Perhaps one of the greatest issues facing new vegans is the concern that they will have enough protein in their diet. While animal products are the common sources of protein in the typical western diet, we really do not need burgers or steaks to get enough protein. 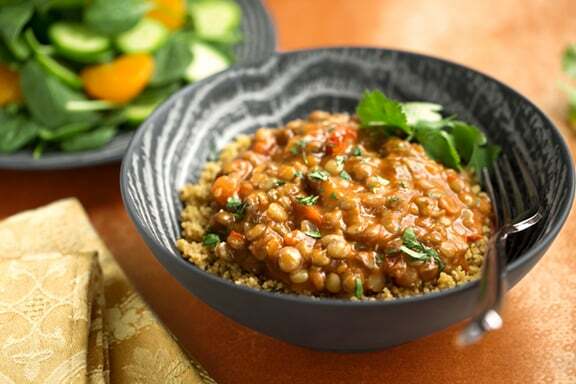 The easy Lentil Curry Dinner above proves the point. You do need protein. Just enough, not in excess. But when protein intake is inadequate, the body will burn muscle for fuel. This leads to a slower metabolism and a slow increase in body fat, definitely not what we are after. A common misconception about vegan diets is that it is hard to consume enough of protein. Although animal products are considered sources of complete protein, one can easily derive more than enough protein from a vegan diet. The Recommended Daily Intake for protein is about 36 grams for every 100 pounds of body weight. For example, a 150-pound woman only needs to consume about 54 grams of protein per day. Complete proteins are found primarily in animal products and contain all of the 20 amino acids needed by the body. Incomplete proteins which are found mostly in fruits, vegetables, beans and nuts, contain some, but not all of the amino acids. Amino acids missing from some foods must be eaten in other foods in order to enjoy a complete protein diet. But contrary to what became popular mythology in decades past, you need not obsess over incomplete proteins and how to match them up. In a healthy, varied diet, those amino acids will find one another throughout the course of your daily fare. Eat a variety of foods such as whole grains, fruits, vegetables, legumes, seeds and nuts. Increase intake of legumes and nuts since these foods have the most protein available in smaller servings. Incorporate soy products into the diet regularly. Soy is a rich source of total and complete protein. 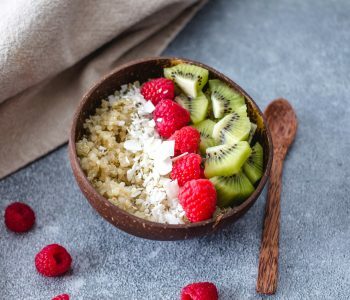 Consuming a vegan diet doesn’t necessarily mean that you are consuming different foods, but often involves making simple substitutions to foods you currently eat. Most foods that you regularly eat can be made vegan with little effort. For example, you can still enjoy burritos, but instead of meat and cheese, you may substitute beans, salsa and vegan cheese. Roadblocks such as being used to a certain diet for a long time, then making a sudden and dramatic change can cause some to lose their resolve. Finding ways to consume these familiar “transitional” foods will help you maintain your resolve and continue your vegan lifestyle. So you like hamburgers? 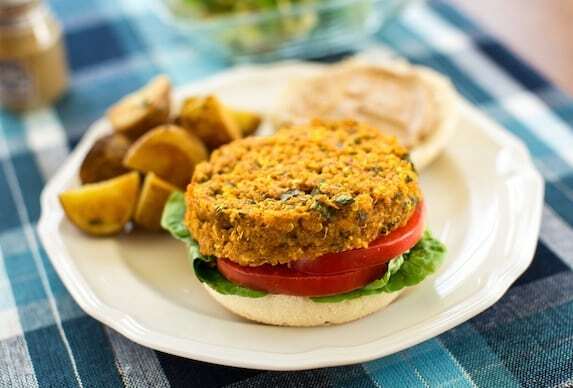 Make a scrumptious veggie burger like the one at the top of this poste and have at it with a colorful salad. Like pizza? Make it yourself with vegan cheese and load up on the vegetables. Stuff green peppers with a rice and veggie blend. Vegetable stir-fry recipes are everywhere. A pot of meatless chili will definitely stick to the ribs. Stuffed potatoes with your favorite seasonings will hit the spot. Having a sweet attack? Dates and pineapple chunks taste like candy. Baked apples drizzled in cinnamon and agave are delicious. 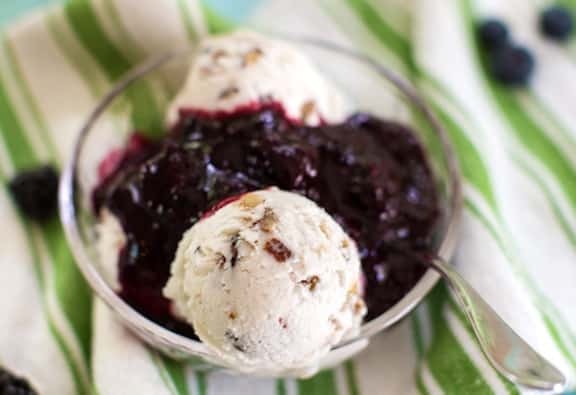 Going vegan doesn’t mean you’ll be giving up baking and sweets — there are tons on this site alone. Have fun in the kitchen with your new recipes. Get rid of all animal products in your refrigerator. This means all meat, dairy, eggs and fats (such as butter). Get rid of all animal products in your pantry. This means all canned meats and any other canned or boxed item that contains or was processed with animal products. Do this all at one time. Simply say goodbye to the whole lot. Either toss them or donate them to the local food shelter. Buy a vegan cookbook online or at your local bookstore. Of course, there are countless free recipe sites that feature an infinite variety of delicious vegan recipes. Create a meal plan for the very first month to include breakfast, lunch, dinner and snacks. Make a grocery list with your new meal plan in hand. At the end of 30 days, you won’t rely as much on your cookbooks and meal planning. You’ll be on your way to being a seasoned vegan shopper and chef. You might even be a few pounds lighter, have more energy than ever, and feel a new glow about yourself and the choice you’ve made. Congratulations! For those who honestly feel that they want to make the change to a vegan diet, but just can’t seem to exercise their commitment all at once, ease into your new lifestyle by methodically eliminating animal products one day per week until you have reached your goal of seven days without the consumption of animal products. Dr Linda Kennedy MS SLP ND: Is an avid animal activist and nature lover. 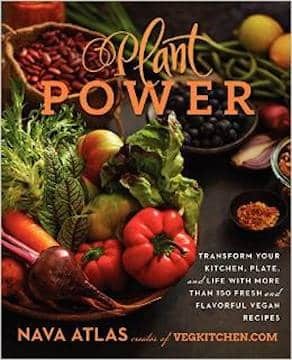 Here’s the ultimate guide to transitioning to a vegan diet and lifestyle: Plant Power: Transform Your Kitchen, Plate, and Life with More than 150 Fresh and Flavorful Vegan Recipes* delivers a beautiful must-have guide with more than 150 delicious and versatile plant-based recipes for every day of the year. Eating vegan doesn’t have to be about sacrifice and substitutions. With Plant Power, Nava Atlas celebrates the bounty of natural foods and teaches everyone—from committed vegans to those who just want more plants in their diet—how to implement a plant-based approach to their lives—easily, practically, and joyfully, every day. You said that baked apples with cinnamon and honey are a good alternative, however this is wrong. Honey is not a vegan product as it is made by bees, so new vegans beware! Honey is not vegan. But alternatives like cane, beet, and fruit sugars are a good alternative, in addition to agave and corn syrups. Stevia extract is also a new and popular sweetener. Good luck new vegans! Celina, you are right. This is a contributed article, and I guess I didn’t realize it made reference to honey. So I just changed it to agave. Thanks for your eagle eye and for your comment. Honey made by bees? That’s like saying you can’t eat you own food because it was touched by human hands. Agave is pollinated by bats. Insects play a role in our ecosystem and to exclude that is probably not what you had in mind when you went vegan. The idea of eliminating animal products to edify health or perhaps as a moral responsibility, isn’t extended to the creation of honey by these important creatures. Taking veganism to the extreme would by necessity exclude anything sprayed with chemical pesticides, most of which come from petroleum, which is crude oil completely polluted with insects, feces, and other animal debris. Any lanolin in your personal products, or wool or silk in your clothes? Sheep and worms. Lee, Honey is effectively bee vomit. It is produced by bees kept by humans. Agave syrup isn’t an animal product – it doesn’t come out of an animals body and no animals are kept in order to produce it. Unless I’m mistaken, most vegans do eat organically sourced foods. And clothes? Plenty of vegan options out there, hemp among them. The level you take your veganism is down to you, but telling people not to take it to the extreme, I feel, is counterproductive in reducing animal harm. Paul, all of the crop production in the world requires pollination by bees. So by your logic then, wouldn’t it be unethical to consume anything that grows out of the ground, because bees labour to pollinate all plants? Bees will produce honey whether they are in man-made hives, or hives in the ‘wild’. It’s not ‘vomit’, it’s a by-product of pollination and occurs naturally. And beekeeping operations don’t confine or harm bees in any way; the bees live in man-made habitats as they would live in the wild, and their honey (which would otherwise be consumed by other animals, along with their hives) is consumed by us (at no harm to them, or their hives). It’s a harmonious, and symbiotic relationship. Many organic farmers have beekeeping operations to encourage pollination of their crops. And given that our bee populations are in serious trouble, I think that creating hive-friendly habitats created by beekeepers to encourage the breeding of bees has a role to play in ensuring their survival. I support my local beekeepers for this reason, and always go out of my way to purchase honey at my local farmers market. Great article! Currently, I am transitioning into a vegan lifestly. It is difficult and I experience a great feeling of failure when I make a mistake. I am going to keep trying. people said The item baked apples within cinnamon AS WELL AS honey are the alternative, however It is wrong. Honey is not a good vegan goods Just as This can be made coming from bees, thus new vegans beware! Honey is usually not vegan. But alternatives including cane, beet, ALONG WITH fruit sugars are usually a great alternative, AND ALSO agave IN ADDITION TO corn syrups. Stevia extract will be likewise a fresh ALONG WITH popular sweetener. Good luck new vegans! living a healthy lifestyle. I have been following the debate about honey. Am I missing the point here, what’s wrong with sugar? I stuff my baked apple with dried fruit and dark brown sugar. Delicious. Bee Free is a honey made from apples and is very affordable. I do eat local honey it has been valuable in helping with my allergies. Thats so interesting, Michele — I learn something new every day. Bee Free might be a better alternative to agave, as well. Thanks for your comment! Pear honey is so yummy! Been making it for a couple months now and it is a favourite, love it. We need to get more people to become in love with a healthy lifestyle. you guys she said agave, agave is plant derived she never said anything about honey. agave is a great substitute for honey and any sweetners that you use artificial and other wise. Bees will continue to pollinate and make honey regardless of whether humans do/do not consume their by-product. I’m wanting to get my all natural effect of health. And I don’t like eating animals or their products or waste. I want to educate myself more and more all that I can. Just looking for all information that I possibly can. Amber, the discussion about honey is just in these comments … one of the commenters brought up the issue and it has continued to be discussed. Raw or cooked? Oxalate rich vegies or low oxalate vegies, respectively. New vegans should always cook their vegies until they have established an oxalate tolerance…I learned the hard way. OXALATES CAN BE POISONOUS IF CONSUMED IN LARGE AMOUNTS. Spinach is on of the highest sources–.93 g/kg i believe or something like that…google it. Correct me if I’m wrong. Thanks!!! –Also cook vegies with iodine salt and water to avoid hyperthyroid issues from oxalates. And don’t use vegetable oils such as olive oil–they create trans fats when heated…lame but sad but true!!!! May the lord bless you forever and ever!!! Switching to a vegan diet is a whole new experience. With the right food and added supplement, long life is at hand. Great article! Veganism has come a long way and now, I want to take the challenge in transitioning to a Healthy Vegan Lifestyle. Thank you for sharing! Reading this made me realize that it is not really easy to become a vegan. I hope I will be able to transform my lifestyle to being a vegan. Thank you so much for sharing! Yes, protein instead of unhealthy fats. It would definitely make a difference. Great tips! For the people in the comments that are confused, she said agave, agave is plant derived she never said anything about honey. agave is a great substitute for honey and any sweetners that you use artificial and other wise. This is great, I love this post. People should know that vegetarian food can improve health, minimize animal cruelty, and sometimes it feels much closer to religious beliefs and ideologies. Interesting read! Really enjoyed this article. Our company is trying to get people in the office to switch to the vegan lifestyle. Interesting article. I am beginning my transition into the vegan lifestyle and was trying to figure out how. My biggest concern that I didn’t see in the article are their any side effects in transition? It feels like a strange question but I am just asking. I just ordered a vegan cookbook. I have recently become a vegan but will continue to use honey. We are all impacting the earth, how much so it’s down to our own ethics on the matter. Choice is individual and no one should judge. I thought I would struggle to find tasty alternatives to eat, but I was so wrong. I’m 50 net year and my new vegan husband is in his 60’s and we both love it!! Thank you for saying that eating vegan does not automatically equate to being healthy. Vegans are just as in danger of making bad food choices which may harm their health. This is something that new vegans need to keep in mind. It’s very important to plan your meals so that you get all the nutrients you need and not excessively consume plant-based ingredients that might give you diabetes or kidney stones. Just to add to my previous comment: As for staying motivated while trying to transition to a vegan diet, I think we should constantly remind ourselves why we’re living this challenging but worth-it lifestyle in the first place: to live healthier lives and to preserve animal life and the environment. An online calculator like this one (https://www.blitzresults.com/en/meat/) can show us in more tangible terms just how our chosen lifestyle has positively affected the environment and the animals we all love.